Isn't this a sight to behold? 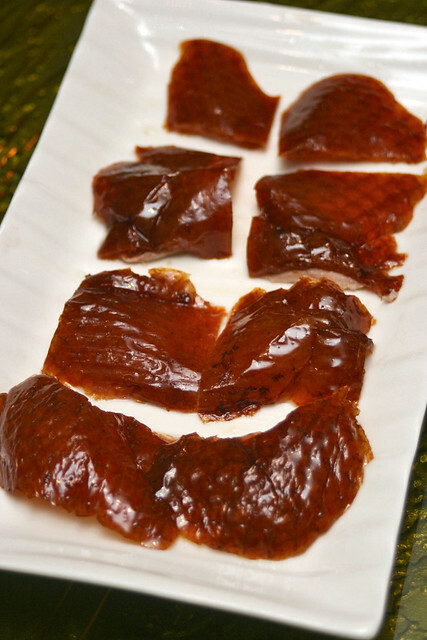 Paradise Pavilion's signature Peking duck (S$88) is as close to the Beijing real deal as you can get. I was fortunate to be part of last year's annual dinner here with the Radio 93.8LIVE team Eugene and Howie, along with fellow Foodie Lunch Pick contributors Hoong An, Leslie and Leroy (I occasionally guest on the show). 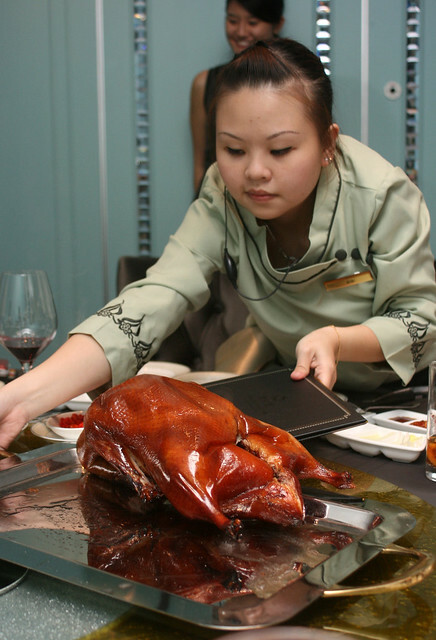 Is there a difference with traditional Beijing style Peking duck? Well, each duck is roasted only upon order and it takes about 50 minutes (so pre-ordering is wise, but don't come late!). 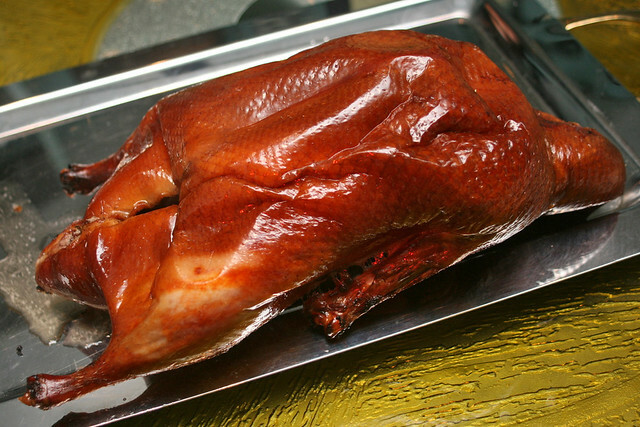 Many Cantonese restaurants crisp the skin by dousing the bird in hot oil, but Paradise Pavilion browns the skin carefully over aromatic woodfire. It is brought to your table piping hot, and the chef starts carving it soon after, to avoid the skin collapsing and crinkling upon cooling. Paradise Pavilion sought and hired two chefs from Quan Ju De (official website's in Chinese, see Wikipedia page for English details). This famous chain in China is one of the few big names synonymous with Peking duck, and has a culinary history that dates back to 1864. Quan Ju De now sells over 2 million ducks a year, and is a nationally cherished brand. The prized first round of skin carved from the breast. The layer of fat under the crispy skin melts on your tongue like snow meeting a brazier. There is also a sliver of meat accompanying the skin, so you also get the tender sweetness of duck flesh. One of the best ways to enjoy it is to dip it in sugar. 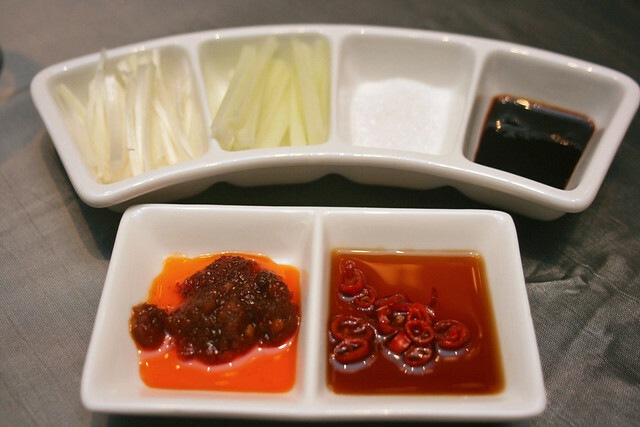 If you think that sounds weird for Peking duck, just think of prata with sugar. Fat + sugar = win! The condiments and ingredients given will also be used for the subsequent rounds of carvings. There is more meat the second time around, along with the skin. You wrap them with scallions, sliced cucumber and bean sauce in thin flour pancakes (not the modern egg crepes). I should have taken a photo of the flour pancake, but the duck was just too gorgeous! 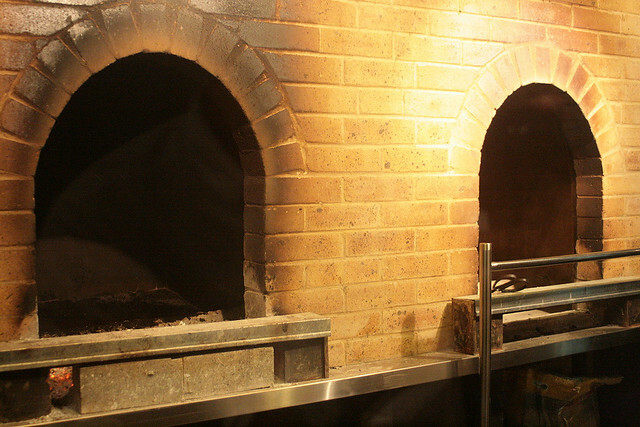 Paradise Pavilion is so serious about following the Quan Ju De way that its stone ovens are hand-built to the exact measurements as those in Beijing's for even roasting, and the restaurant imports applewood from China. 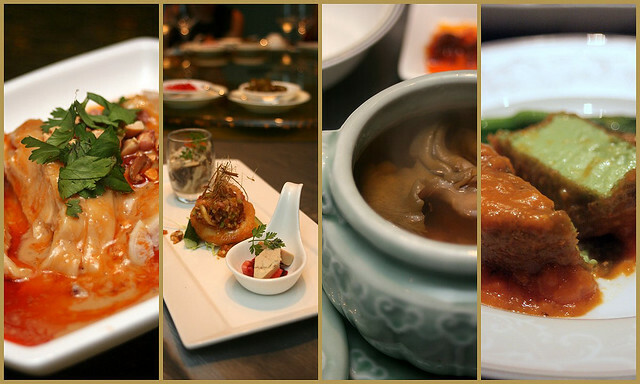 There were some other dishes that we tried, including a tender poached chicken in a mildly spicy Sichuan sauce with creamy peanut butter, a trio of modern appetisers, a hearty double-boiled soup with sea treasures, and edamame tofu topped with crab roe. 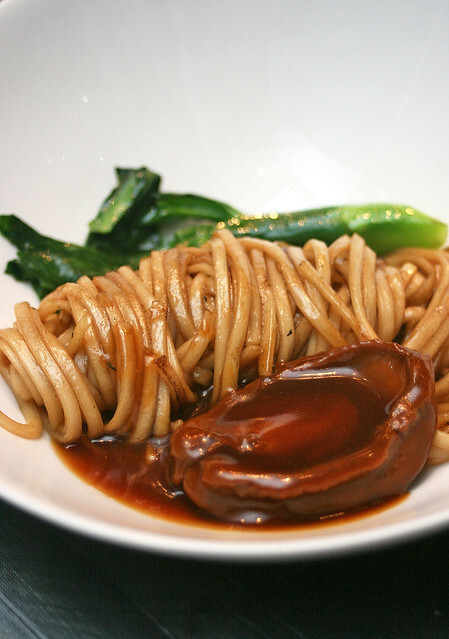 But I have to highlight the Wok-fried Ramen with 6 Headed Abalone in Abalone Sauce. Not so much for the abalone, but the noodles! They had amazing texture and wok hei! The restaurant itself is uber-posh. 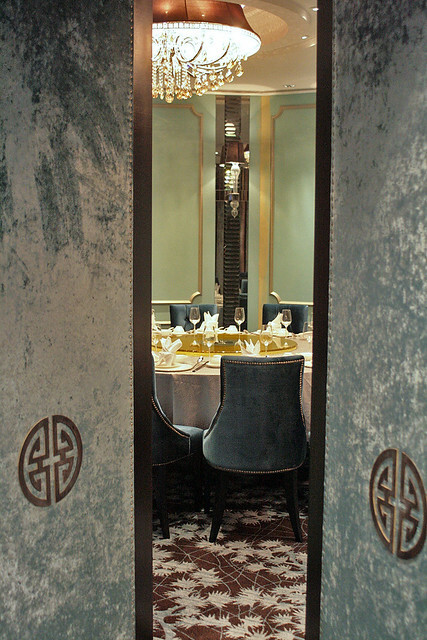 Here, swinging panels of dark wood finished with velvet and golden studs open up peek-a-boo style to a private dining area. It simply looks like no expense has been spared to make this place look as opulent as it can be. The decadent fabrics and furnishings are French-inspired and luxuriously neo-classical. 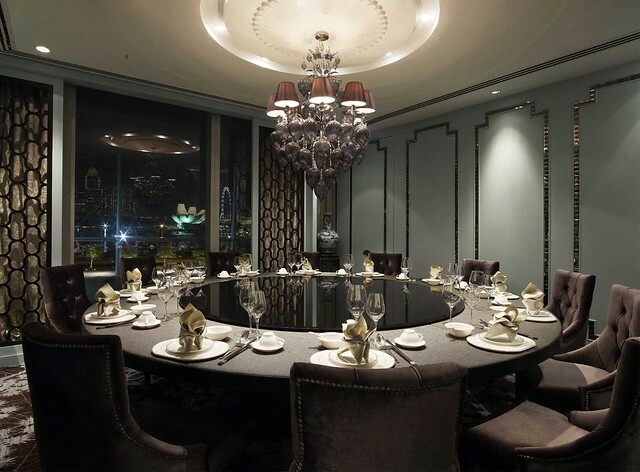 This is one of the five private rooms we dined in. Too bad I did not have a wide-angle lens that could do the place justice, so I am using an official photo, courtesy of Sixth Sense Consultancy. It was an honour to meet Paradise Group CEO Eldwin Chua, a man living his dreams with the rapid expansion of the Paradise Group of restaurants. Not bad for a guy who started out as a zi char cook. Big thanks to him and Carlyn from Sixth Sense for hosting this dinner, and thanks to 93.8LIVE for inviting me. 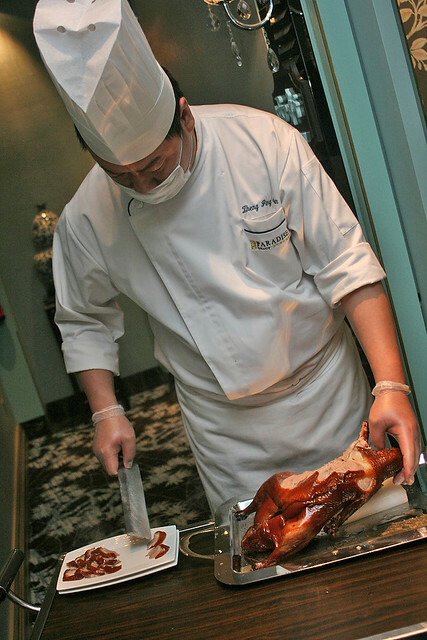 Check out also Leslie's lengthy 101 on Beijing Roast Duck. Slurp: yeah, the roast duck was good. I want to try their dim sum too! LFB: I know, when I was skeptical when I first tried the Peking duck with sugar at One on the Bund last Feb, but I now see the appeal!